There are presently over 15 million alternative fuel vehicles on American roadways today. 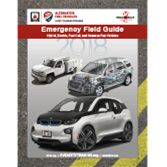 Be prepared to address potential hazards and know how to handle these Electric, Hybrid, Fuel Cell, and Gaseous Fuel Trucks, Buses, Commercial Fleet and Passenger Vehicle challenges safely and effectively with NFPA's Emergency Field Guide*, 2018 Edition. NFPA, the fire and life safety leader, presents the 2018 Edition of its Emergency Field Guide, your source for the latest facts on safe response to alternative fueled trucks, buses, commercial fleet and passenger vehicle incidents involving damaged high voltage batteries and gaseous fuel systems, fire events, delayed ignition, extrication challenges, submersion, and charging stations and refueling stations. This one-stop guide covers the vital aspects of electric, hybrid, fuel cell, and gaseous fuel hazard awareness and procedures -- including information from related NFPA codes, OEMs and new consistent Moditech Rescue Solutions® vehicle diagrams. Featuring more than 100 new or updated alternative fuel vehicle models added to the 2018 Edition, direct from the auto manufacturers. *NFPA is offering the PDF of the Guide free of charge to the US Fire Service. Be prepared to address potential hazards and know how to handle Electric, Hybrid, Fuel Cell, and Gaseous Fuel Trucks, Buses, Commercial Fleet and Passenger Vehicle challenges safely and effectively with NFPA's Emergency Field Guide*, 2015 Edition. NFPA, the fire and life safety leader, presents the 2015 edition of its Emergency Field Guide, your source for the latest facts on safe response to alternative fueled trucks, buses, commercial fleet and passenger vehicle incidents involving damaged high voltage batteries, battery fires, extrication challenges, submersion, and charging stations. This one-stop guide covers the vital aspects of electric, hybrid, fuel cell, and gaseous fuel hazard awareness and procedures -- including information from related NFPA codes, OEMs and new consistent Moditech Rescue Solutions® vehicle diagrams. Featuring gaseous fuel vehicle safety information including; bio-diesel, Compressed Natural Gas (CNG), Liquefied Natural Gas (LNG), and Propane (LPG); added to the 2015 Edition, direct from the auto manufacturers. Vehicle immobilization. Disabling procedures for high-voltage and SRS systems. Conducting safe extrication cuts with new Moditech Rescue Solutions diagrams. Executing vehicle recovery and disposal. It's all here!